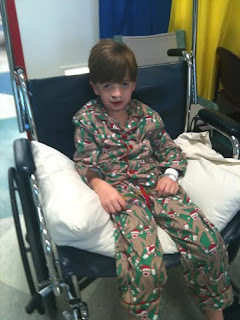 We left the house at 4am and headed to St. Joseph's Hospital in Tampa. After getting admitted and meeting with all the Dr's he went back around 8am. They told us it was going to be about 3 hours but around 9am they call us and tell us "we are just getting started and so far everything is going good!" I was a little shocked that they had had him back there and hadn't even started. My emotions were getting the best of me at times during the next three hours. Just thinking about my boy being back there and what they were doing to him. Jared and I took a few walks around the hospital and watched a bunch of shows on HGTV in the waiting room to keep occupied. Thank you all so much for praying for Andon through this surgery. Please continue to pray for healing on his mouth and hip. Hopefully within a couple of weeks he'll be all healed and back to some normalcy before our little girl arrives!! sweet little guy- thanks for the update.